This week we will be celebrating the Fast and the Feast of Jonah. Scheduled services are as Usual. 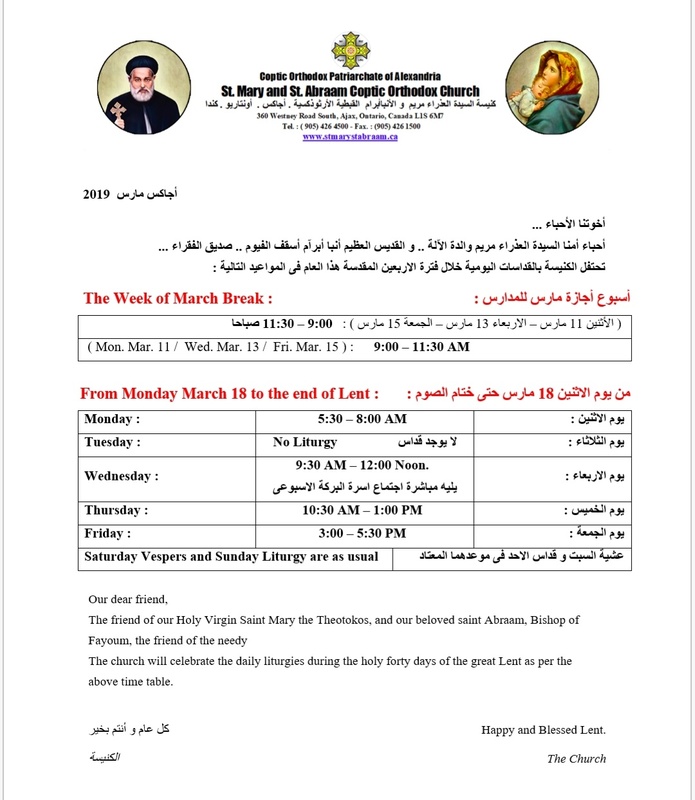 Divine Liturgy at 10:00 am - 12:30, followed by a spiritual day ends at 5:00 pm. 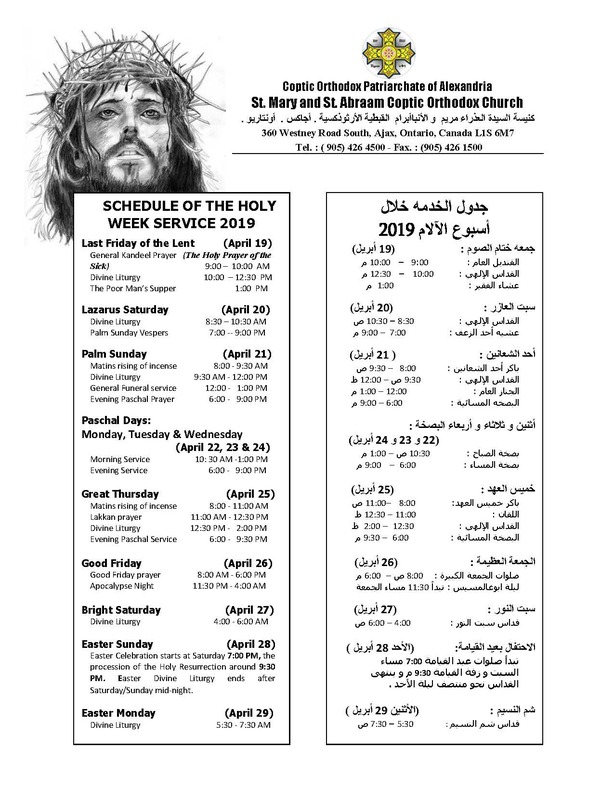 Divine Liturgy @ 9:00 - 11:00 am followed by the weekly seniors Meeting. Happy Jonah Fast and Feast to everyone. الاثنين : ١٠:٠٠ ص- ١٢:٣٠ ظ، و بعده يوم روحى حتى الخامسهً بعد الظهر. الخميس : ٩:٠٠ - ١١:٠٠ ص، و يعقبه اجتماع أسره البركه ( السنيورز) الاسبوعي. لا يوجد قداس يومى الجمعه ١٥ ، ٢٢ فبراير. Please note that there will be no Liturgy this Friday, February 1st. Divine Liturgy as usual at 9:00 AM followed by the Seniors meeting. The Feast of the Epiphany: No Vespers in the afternoon. The schedule is as usual. Wednesday Liturgy (@ 9:30 AM, Followed by the Seniors weekly Meeting. Followed by Santa Day celebration for our Sunday School Children @ (11:00 AM - 1:00 PM). Everyone is welcomed. 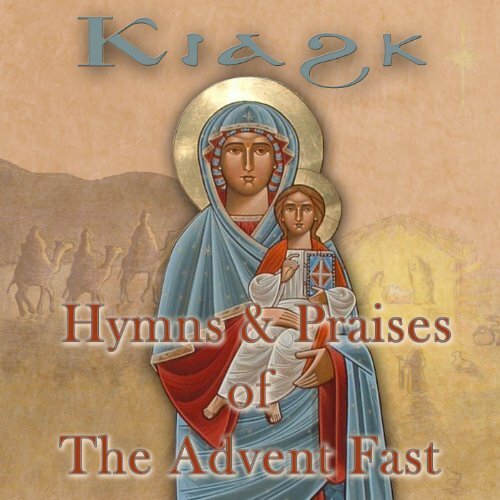 There will be a Kiahk Praises Prayers Night starts Thursday Dec.27th @ 10 PM and ends with the Friday Liturgy. The praises of Kiahk will resume this week until the celebration of Christmas. Please attend and invite others to take a blessing of the prayers.